It's true, I confess. I love stories set around the holidays. I think the holiday movies I so love rank among my favorite movies of all time....few films do I watch as many times as these! Therefore, I was eager to dig into Have Yourself a Movie Little Christmas. I was skeptical, though, that Duralde would really be able to introduce me to any new Christmas films. After all, I consider myself rather an expert on digging up as many Christmas films as I can each season. But alas, I was so so wrong, and I'm so glad! Duralde divides the book up into several chapters, starting with films for the whole family. His choices for kids movies are among my favorites, Ernest Saves Christmas, Little Women, and Prancer. (and more) This gave me a lot of hope, that the other films in the book would also appeal to me. There's such a trust factor in recommendations and he established it early on. He gives a brief synopsis of each film and goes on to describe why it's particularly suited for the holidays along with a brief review. He doesn't give every film a glowing recommendation, but mentions why it may or may not suit you for the holidays. Finally, he shares several fun facts. I appreciated this, because my knowledge of film history is not that great and it was kind of like having all these blank spaces filled in or dots connected...AND it made me really curious to learn more about it. Following the section on kids, he had a section for grown-up movies. Some of these admittedly seemed like odd choices to me (The Box?) and several of them were adult themed (Eyes Wide Shut). But the great thing about a guide like this is that you can look for what interests you and I still managed to find several films in this section I'd like to look for. I was surprised by how many classics I was unaware of. The sections on comedies and holiday tearjerkers also introduced me to several films I'd like to check out during the future holidays. 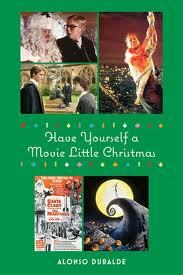 There are also sections on crime/action/adventure and horror films for the holidays. I have to admit that while I read the crime and action section, I skipped over the horror section. I am just not interested in horror films during Christmas! I know such a section is needed to make a guide like this complete, though. One of the most fun chapters is on the all of the adaptations and modernizations of A Christmas Carol. I was pleased to see all of my favorite versions mentioned...George C. Scott, Mr. Magoo, and Mickey's Christmas Carol. (I can't help it, I just love it.) He mentions who plays all of the various characters and how they do, what makes the version unique, how it rates as an adaptation and how faithful it is to the original. He then wraps it all up with his own awards for who is the best at what! A true treasure for fans of this story. The final chapter in this book includes what Duralde considers the untouchables...the wonderful classics. Of course, It's a Wonderful Life and Miracle on 34th Street make this chapter but I was beyond delighted to see Meet Me In St. Louis there as well, along with a mention of how artists have brightened up the sadder lyrics to "Have Yourself a Merry Little Christmas" (thus making it less meaningful in my opinion) There was one I'd never heard of We're No Angels, which I guess I'll have to check out! I thought it was interesting that he felt he couldn't fully recommend one of my favorites, Holiday Inn, due the scene where the characters wear blackface. While I do see the racism of this part of the film, I also find it true to the times. (this doesn't make it right) I was glad he mentioned it though, and why it wasn't included fully in the guide. Additionally, there's an appendix in the back with more holiday films listed. I absolutely loved reading this book and can't wait to check out some of these movies. Again, it should be noted not all of the movies are Christmas movies, but they contain ties to the holiday in some way. Highly recommended if you love to think about the holiday through film. Here are a few movies I want to watch after reading this. Have you seen any of them? Would you recommend them? Also, I am interested in reading more books on film like this one. Do you have any recommendations?